Article des Dernières Nouvelles d’Alsace, édition de Mulhouse, publié le 7 juillet 2014. Article DNA Mulhouse du 5 juillet 2014. Well- not exactly what I was expecting from a guy with French Canadian blood in his veins. Sounding like a young Johnny Cash- it’s surely no coincidence that the title track is a Cash classic- and indeed, 3 of the 4 songs on this sampler are all associated with The Man In Black. In 2002 M. Soul (Marcel Soulodre) came up with the idea of creating an homage to the life and songs of Johnny Cash. 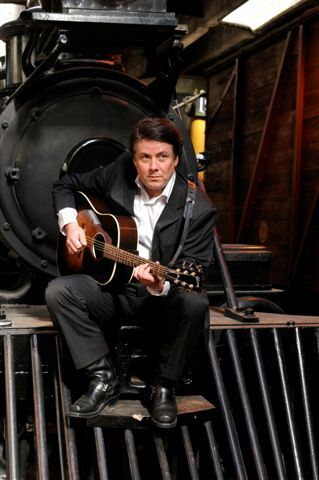 He has created a 2 hour performance rich with the details of the life of Johnny Cash, the 50’s thru 70’s, and of his own personal experiences as a child growing up in Winnipeg. This EP is his 9th release, and I think Cash fans would agree that Marcel does his music justice. Produced by the artist himself Guns is a fine sounding set, and by the time the self penned Riverboat Roustabout finishes up, you’ll find yourself wishing there was more. I have no idea what Soulodre’s other stuff sounds like but he’s sure comfortable in Johnny Cash’s groove, and I think Johnny would approve- you know, if he wasn’t still dead. 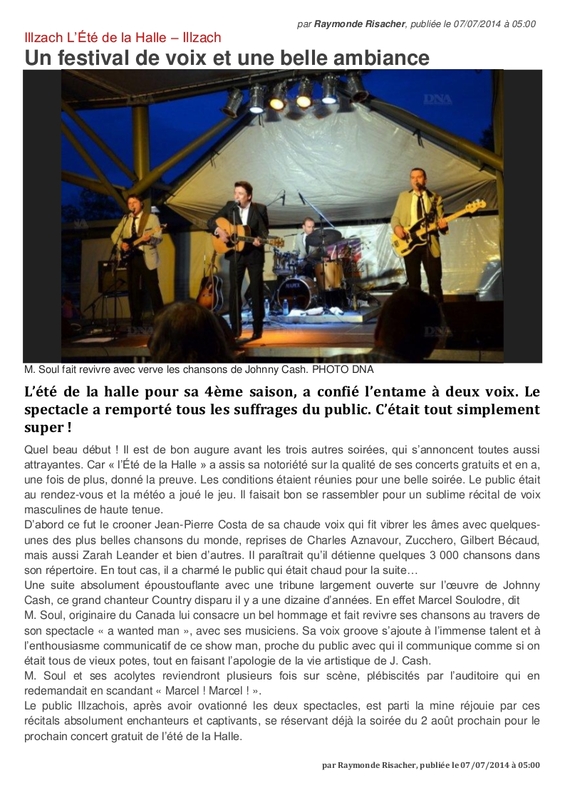 Le public a vibré, vendredi soir à Goersdorf, grace à la musique de Johnny Cash. Le concert de M. Soul, qui se déroulait à La Couronne d’or a attire un public nombreux. Une soirée memorable est à inscrire dans les annales du restaurant de Michel Dammeron. 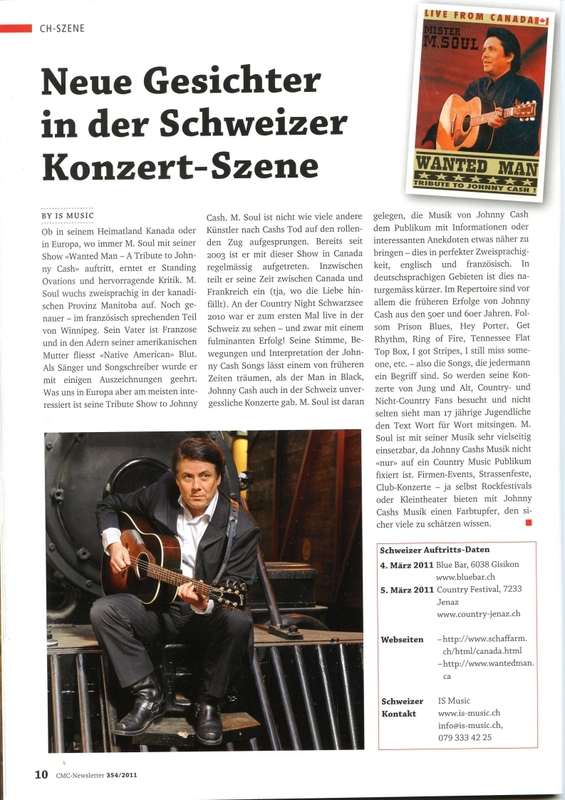 La musique country de Johnny Cash a fait vibrer le public de la Couronne d’or à Goersdorf. Cette soirée inoubliable, le public la doit à Marcel Souldore, plus connu sous le pseudonyme de M. Soul. Originaire de Winnipeg, au Manitoba dans l’ouest du Canada anglais, M. Soul compte des aïeux français originaires de Nantes et de la Lozère. Des origins dont l’artiste est fier et qui lui ont permis d’apprendre et de parler un français impeccable avec cet accent américain mélangé à un soupçon d’accent canadien. Amoureux de la musique M. Soul se lance dans la chanson. Depuis 1983, il se produit sur les scènes d’outre atlantique et en Europe. Auteur-compositeur, il a écrit plus de 250 chansons en français et en anglais. Il a composé la musique pour six pieces de théâtre en français de 1987 à 1990 à la demande du Cercle Molière, chanté pour l’ouverture des Jeux Panaméricains en 1999 devant 500 millions de téléspectateurs. En 2003, une envie pousse M. Soul à rendre un hommage à Johnny Cash. L’amour de la musiqe country qu’il ranime à la perfectrion l’emmène à travers le Canada et les USA, mais aussi en Europe, où il fait de fréquents allers-retours. Vendredi soir à Goersdorf, M. Soul a conquis le public qui le lui a bien rendu en saluant le tour de chant par de nombreux applaudissements et des sifflets comme dans les saloons du far-west. Philippe à la basse, Maxime à la guitare et Jonathan à la batterie ont contribué au success de M. Soul, qui a rappelé les bons moments du poète des cols bleus, le people ouvrier, l’homme en noir qu’était Johnny Cash. Lumiére sur << L’homme en noir>> Marcel Soulodre présente depuis huit ans en Amérique du Nord et en Europe son spectacle Wanted Man, qui rend hommage au chanteur guitariste américain Johnny Cash, décédé en 2003. Il sera de retour à Winnipeg le 4 août prochain. L’ombre, ou plutôt la lumière de Johnny Cash planera dans la salle du Casino McPhillips Street Station, qui accueillera le spectacle Wanted Man, un hommage à Johnny Cash par le chanteur Marcel Soulodre, le 4 août prochain. Sous le nom M. Soul, Marcel Soulodre s’attaque à un mythe de la folk américaine qui, en presque 50 ans de carrière, a enregistré plus de 2500 chansons et pas moins de 60 albums. Depuis 2003, le chanteur natif de Saint-Boniface et ses musicians ont présenté le spectacle dans toute l’Amérique du Nord et en Europe, constatant à chaque fois la ferveur intacte du public pour le chanteur américain. Johnny Cash a en effet été un repère pour Marcel Soulodre. Alors que ce dernier cherchait à améliorer son chant pour ses propres chansons, il commence à s’inspirer du style de Cash pour travailler sa voix, puisque les deux hommes ont en commun la même tessiture, celle de baryton. 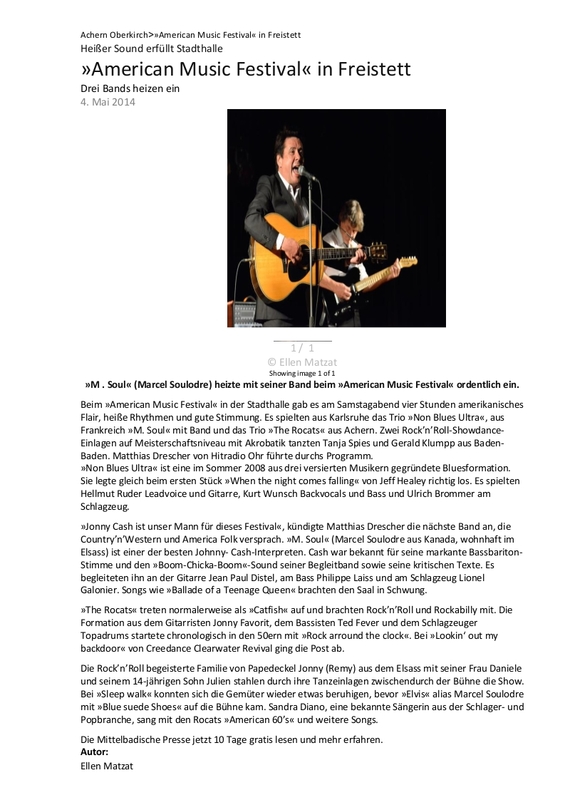 Lors d’un concert en 2003, il reprend quelques titres de “l’homme en noir” (Johnny Cash était ainsi surnommé pour la couleur presque toujours sombre de ses vêtements). La reaction du public est si positive que le groupe rejoue une deuxième fois le set. L’idée est lancée, et Marcel Soulodre devient en 2003 le premier à créer un hommage à Johnny Cash, avant même que le chanteur ne décède quelques mois plus tard. Le spectacle est pensé de façon à rester le plus fidèle à l’original. “Nous jouons dans toutes les tonalities originales, avec la même formation que Johnny Cash utilisait sur scène des années 1950 à 1970, à savoir avec un guitariste éléctrique, un bassiste et un batteur en plus de moi-même au chant et à la guitare folk”, détaille-t-il. Marcel Soulodre voit aussi dans le succès impérissable de Johnny Cash la marque d’un certain amour pour les traditions et le passé. Johnny Cash a en effet repris et basé nombre des ses compositions sur des chansons folkloriques américaines qui évoquent les grandes espaces et le far west. “Aujourd’hui avec la technoloqie, nous sommes bombardées d’images et de sons. Les chansons de Johnny Cash permettent de se relaxer. De ce transporter dans un autre temps”, conclut-il. Marcel Soulodre grew up in a musical home, with his father a fiddler and his grandmother teaching him the American national anthem on the piano when he was just a little boy. It’s no surprise, then, that the Saint-Boniface-raised Soulodre’s passion for music resulted in a 25 year career, one that had led him to a new home and a nice following for his own music, and his homage to the late singer. 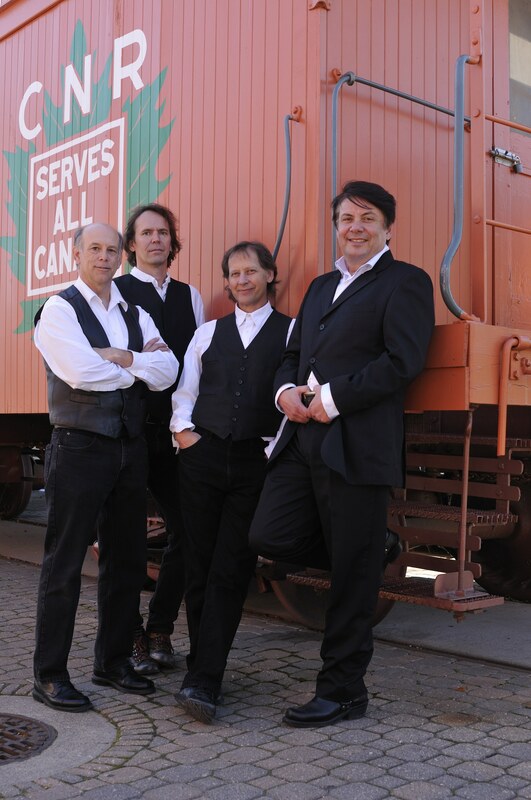 Soulodre’s Johnny Cash tribute show, Wanted Man, will roll into McPhillips Street Station Casino on Aug. 4, and Soulodre, who is now based in Strasbourg, France- said it will be great to be home. “I’ll be seeing all my friends, and going to the Noodle Express restaurant,” he said. Bringing his show home is also a chance for Soulodre to reunite with former colleagues, such as his bassist, Gord Leathers. Leathers, a Saint-Vital based musician, first played with Soulodre in 1983 and said he was thrilled when, years later, his friend gave him a call and asked him to join Wanted Man. “I’m so glad I said yes,” Leathers said. Like Soulodre himself, Wanted Man has its roots in Winnipeg, which is where he first experimented with a celebration of Johnny Cash’s music. Soulodre, a baritone, said he was studying Cash -also a baritone- when the idea for a tribute show came to him. Soulodre’s Wanted Man is scheduled for Thursday August 4, 2011 at McPhillips Street Station Casino. The coolest musician you’ve never heard of! There are enough colloquialisms about persevering through difficult times ‘making lemonade out of lemons’ that they have become almost meaningless. One man who really does know what it means to take an opportunity and roll with it, however is, Marcel Soulodre. The Winnipeg singer/songwriter is back in Western Canada this summer to knock off a few live shows and begin the process of recording a new album with local players before he returns to his new home in Strasbourg, France. He’s a hard working fellow-and yet not too many folks know that this extra-talented Winnipeg boy has made all his moves independently, without major-label bucks or prodding, and with the insistence of one who is committed to his music and enjoys pleasing his fans, whatever country they’re in. Soulodre is of French ancestry, not the Manitoba version but the European brand. At a young age he was exposed to a wide musical palette that included a fiddle –playing dad who bought his curious son a guitar so he could accompany his pop playing traditional tunes. Soulodre was hooked. He fell so in love with music that it washed over him like the Red River in springtime and he grabbed every opportunity he could to get up close and personal with local and touring artists. He met Muddy Waters – twice. He hung outside of teen dance parties, listening local greats such as The Guess Who, The Deverons and Next. He attended the unofficial College of Musical Knowledge and examined the scene in New Orleans while traveling as a carnie, stacking up the musical observations that would eventually from his unique approach to what would one day turn into a full-on career in music — one that most people don’t even know about. Back in the day, he self – released cassettes and compact discs on his Irrational Man label, but once the grind of playing locally seemed pointless, Soulodre took a serendipitous opportunity to play a Paris Expo honouring Canada a dozen years ago. He arrived early to test the gigging waters, as it were, and found that his ability to sing and play both in French and English – and offer a wide repertoire of roots and traditional music – was just the musical passport required to get some pretty steady work. The bell had rung for Soulodre. After making some important and worthwhile connections, he is now based in France, playing throughout Europe most of the year. The story continues with our man Marcel – no stranger to the Peg City scene, having gigged with local heavies such as Colin Bryce, Terry Barnett, Randy Joyce and Gord Leathers. He’s now in Winnipeg to play some gigs – including a sold- out tribute to Johnny Cash at McPhillips Street Station Casino – and record a bilingual album that will no doubt be a big seller across the pond (and, with any luck, maybe even here). He has both a local band and a European combo and could not be happier. For all the reports about local indie bands making waves around the country and stateside, it’s unfortunate that Marcel Soulodre seems to get missed in all the hullabaloo. No one has worked harder or longer at his craft to make the kind of gains this talented man has done almost completely under the local radar. Hopefully that changes very soon. 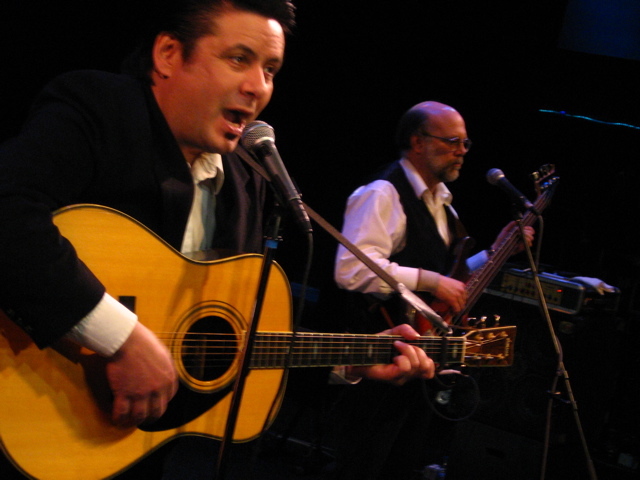 Wanted Man A Tribute to Johnny Cash is at the Centrepoint Theatre Tuesday March 27. 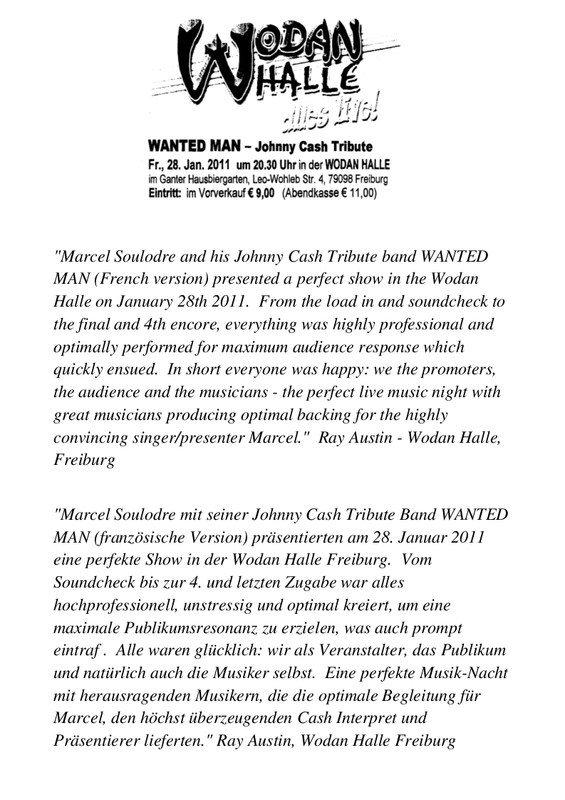 There were no groans, no sighs, and definitely no ‘boos’ at Wanted Man: A Tribute to Johnny Cash aka Marcel Soulodre on Wednesday night. Day 2 of the North West Territory Days had the veteran musician singing at the Grandstands, and some considered him the best of the best when it was all said and done. The Man in Black indeed showed up in black, and proceeded with ‘Folsom Prison Blues’, then ‘I Still Miss Someone’ with his 3 band members wearing white shirts and black vests. Marcel said the ‘I Still Miss Someone’ is his favourite Cash song and kicked the whole tribute off. Soon, he ventured into some less known songs of Johnny, playing ‘Five feet high and rising’ and ‘The Girl in Saskatoon’. As the show progressed, the obvious desire for hit after hit was granted with tunes such as ‘ Tennessee Flat Top Box’ and the always hilarious ‘ A Boy Named Sue’. There was also a very talkative side to Soulodre, asking a little girl if she remembered 1969, and then commenting “I don’t think you remember 1999”. He also told a story of how he and his brother would race home to watch the start of a TV show in which Cash sang the theme: ‘The Rebel – Johnny Yuma’, which he then preceeded to sing. He continued with more antic songs such as ‘One Piece at a Time’ and the haunting ‘Ballad of Ira Hayes’. After ‘Ira’, Marcel stopped and told the crowd that if they did not like this next song because of it not being ‘politically correct’, they should leave or plug their ears. Lo and behold, they launched into ‘Cocaine Blues’. Even today, the song is still controversial. The show also included ‘Ring of Fire’, ‘I Walk the Line’ and ‘Ghost Riders in the Sky’. After he and his band left he stage, the crowd began to chant ‘More’ and ‘Encore’. They were rewarded with ‘Cry Cry Cry’ and ‘Get Rhythm’. Afterwards Marcel was swamped by fans at his van which also served as his dressing room. Soulodre has a similar baritone line as Cash, not to mention the same good looks as the ground breaking singer-songwriter. He himself writes songs, releasing two francophone albums and anglophone albums before starting up his tribute show with bass player Gord Leathers, electric guitarist Lloyd Peterson and drummer Randy Joyce, who has the power to sing a little higher then the average male. He proved this when singing the awkwardly high line “Mama sang tenor” in ‘Daddy Sang Bass’. Marcel has even started his own independent record label called Irrational Man. This label is home to his three albums and the Johnny Cash tribute album called ‘Wanted Man: Marcel Soulodre Sings the Songs of Johnny Cash’. One night a man named Soulodre played a few songs by the Man in Black, and a new music show was born. Marcel Soulodre has never been to jail. Nor has he picked cotton in Arkansas, done drugs with Waylon Jennings or sung on a U2 album. But the Manitoba-born musician has always felt a kinship with Johnny Cash, who did all those things. So a couple of years ago, and about eight months before the Man in Black died, Soulodre dedicated one set in a nightclub show to Cash. The audience hurrahed, Soulodre grinned, and boom!-– Wanted Man a full scale tribute to Johnny Cash, which Soulodre brings to Ottawa on Tuesday — was born. Soulodre, whose English and French singles and three albums have won a clutch of regional and national awards over the past 13 years, first snagged the world’s attention by performing with his family’s orchestra on his brother’s pirate radio station. Eight neighbourhood homes sat glued to those basement broadcasts. Since then, Soulodre has shown himself a man of catholic tastes, writng and covering country, folk, post-punk and zydeco while remaining a jazz devotee. If you know your Cash, you’ll realize that he too never encountered a musical barrier he wouldn’t at least try to hurdle, especially in his spellbinding American Recording series of the 1990’s and 2000’s, when he recorded everything from hymns to Hurt, a song by industrial rockers Nine Inch Nails. Unable to resist the pun, Soulodre, originally planned to name his tribute A Boy Named Sou. Copyright costs, however, dissuaded him and he switched to the generic Wanted Man, which also just happened to be the title of a song Cash performed on the soundtrack of the 1970’s film Little Fauss and Big Halsy. Oh, and Cash’s jail experience? Seven incarcerations between 1959 and 1967 for everything from drug smuggling in El Paso to picking flowers on private property in Starkville, Mississippi. When a man in black takes the stage this weekend at Club Regent, strums his guitar and opens his mouth, Winnipeggers might not believe their ears. How can a francophone machinist’s son from Saint-Boniface sound so much like the famous sharecropper’s son from Arkansas? “I have the same baritone,” says Marcel Soulodre, who spent the last year honing his Johnny Cash tribute show Wanted Man. With three albums of self-penned material to his credit, Soulodre, has been toughing it out for more than a decade as a singer-songwriter. Now, ironically, he may have found his niche impersonating one of the true originals of American popular music. But breaking onto casino mainstages, where the best money lies ready for the taking, poses a Catch-22 for ambitious musicians. The over-40 crowd isn’t big on original or cutting edge sounds. They like what is familiar. Witness the dozens of celebrity impersonators and faded pop acts that troop across Winnipeg’s casino landscape. Maybe nostalgia is comforting when you’ve poured your paycheque into a VLT. “You need to come up with a tribute act,” he was told by a friend who worked in the belly of the beast. “But who?” Soulodre’s first idea was a Ministers of Soul-type show. But he rejected this because it was too elaborate. Next he thought of doing ‘60s crooner Roy Orbison, long one of his idols. 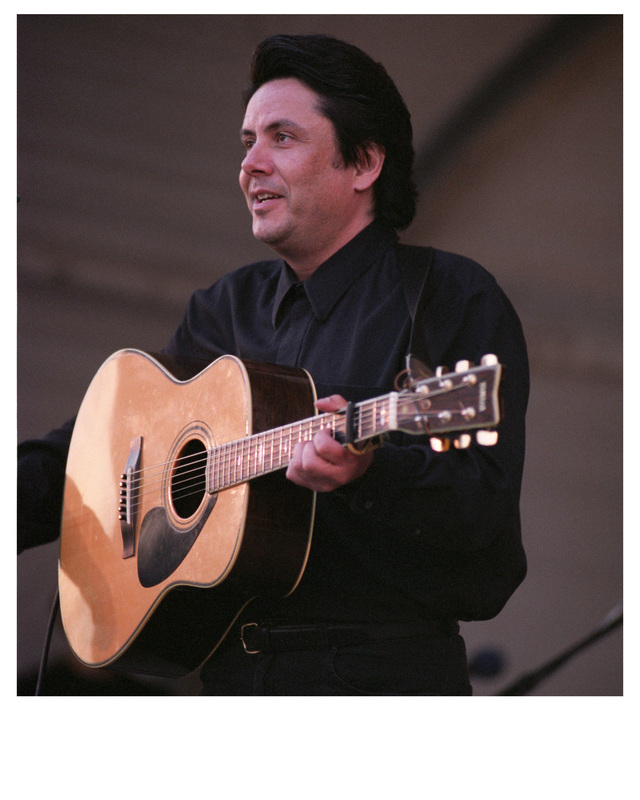 Soulodre can even duplicate Orbison’s distinctive counter-tenor. But it turned out Orbison impersonators are legion. Eventually he lighted on the idea of Cash, whose huge songbook, everything from Folsom Prison Blues to A Boy Named Sue, was ripe for the mining. As well, Cash was unlikely to tour again. Soulodre delved into his research. He sought out veteran Winnipeg entertainer Pat Riordan, regular Club Regent emcee, who helped him understand the demands of casino entertaining. The more Soulodre learned about Cash the more he was impressed by the man and his music. Almost a year ago to the day, Soulodre first tried out his Cash act before a live audience. He sneaked a few songs into the third set of his performance in Le Foyer at the Centre culturel franco-manitobain. The response was heartening. 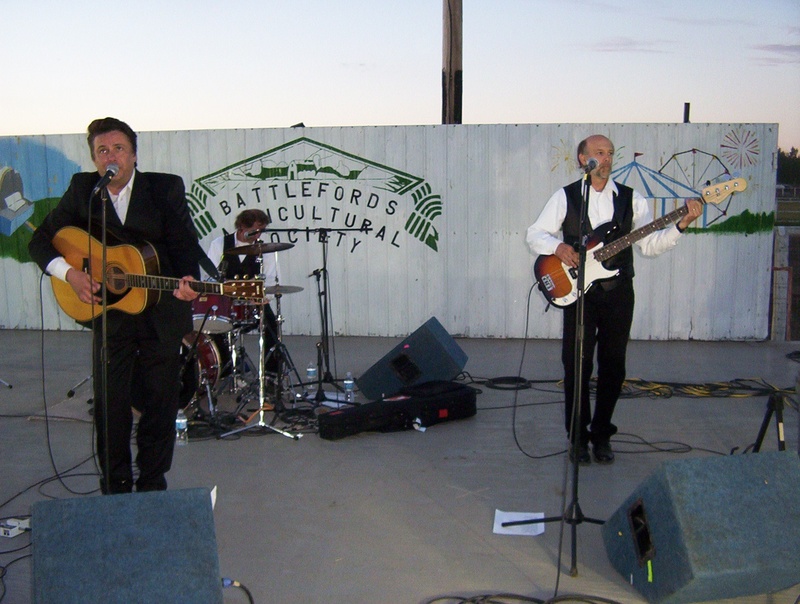 Then, in June, he talked his way into an outdoor gig at the Red River Ex, largely because he delivered as the producer requested, a promotional picture of himself in a Cash pompadour and black outfit. 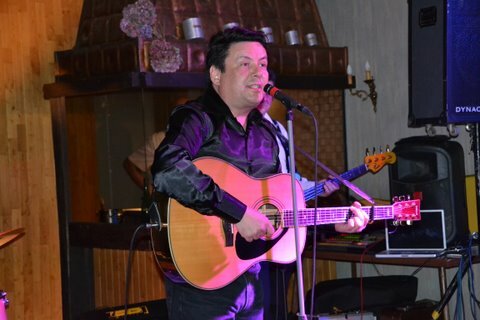 Marcel Soulodre does his Johnny Cash tribute at 10 p.m. tomorrow and Saturday at Club Regent. Originally printed in the Winnipeg Free Press, Jan. 22, 2004, pp. D1 & D2.